Instead of generating events in a loop, we generate events with requestrate and send the event for execution to one of available Requester thread. At the start, we establish N (requesters) connections to database, which are idle by default, and just waiting for an incoming event to execute. The main output of the benchmark is 99% response time for ADD_LINK (INSERT + UPDATE request) and GET_LINKS_LIST (range SELECT request) operations. The related output is Concurrency, that is how many Requester threads are active during the time period. Ability to report stats frequently (5-10 sec interval); so we can see a trend and a stability of the result. So the main focus of the benchmark is the response time and its stability over time. 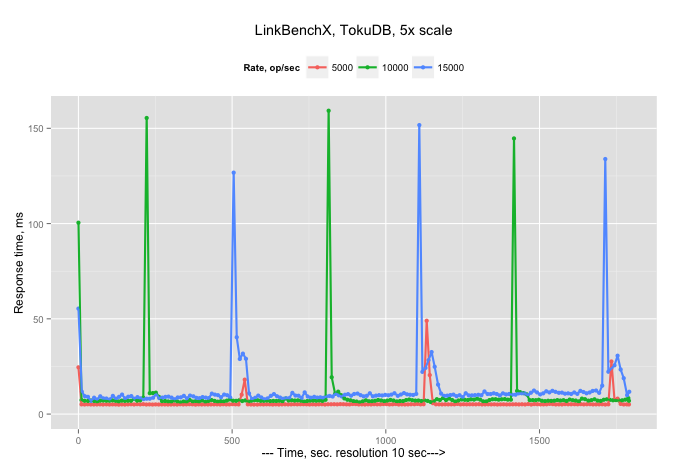 For an example, let’s see how TokuDB performs under different request rates (this was a quick run to demonstrate the benchmark abilities, not to provide numbers for TokuDB). So there are two observations: the response time increases with an increase in the arrival rate (as it supposed to be), and there are periodical spikes in the response time. …with an explainable observation that more threads are needed to handle bigger arrival rates, and also during spikes all available 200 threads (it is configurable) become busy. 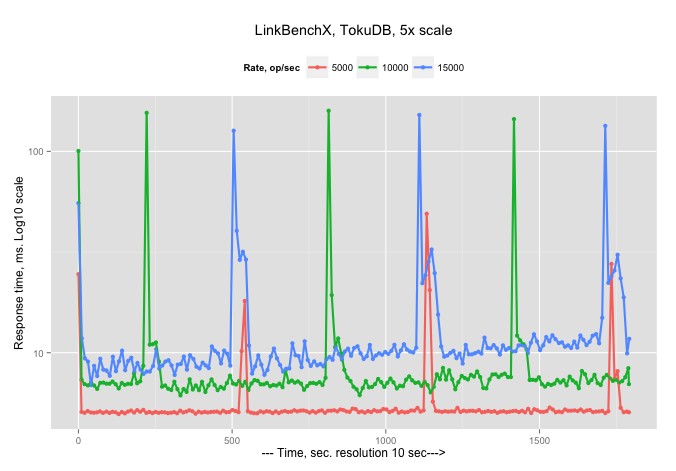 I am looking to adopt LinkBenchX to run an identical workload against MongoDB. I am open for suggestions as to what is the proper design of documents for MongoDB – please leave your recommendations in the comments. 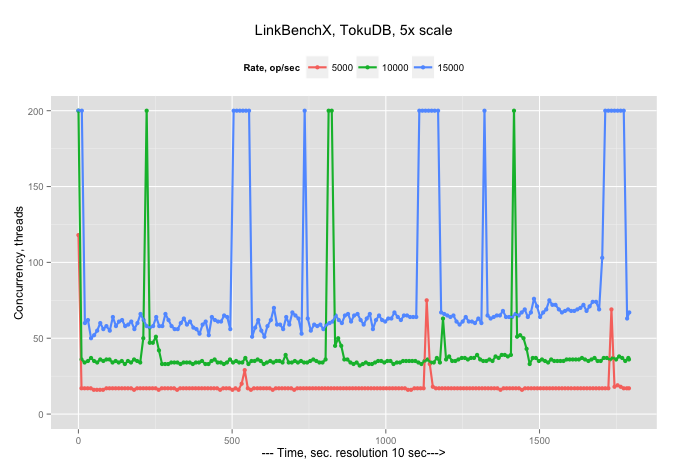 The post LinkBenchX: benchmark based on arrival request rate appeared first on MySQL Performance Blog. There are also three worklogs: WL #3996, WL #8016 and WL #8017. But they describe the general concept and do not have much information about which optimizations can be used and how. More light on this provided by slide 59 from Øystein Grøvlen’s session at Percona Live. But that’s all: no “official” full list of possible optimizations, no use cases… nothing. I tried to sort it out myself. My first finding is the fact that slide #59 really lists six of seven possible index hints. Confirmation for this exists in one of two new files under sql directory of MySQL source tree, created for this new feature. Hint types, MAX_HINT_ENUM should be always last. Looking into file sql/opt_hints.cc we can find out what these optimizations give not much choice: either enable or disable. , – is compatible with style of optimizer hints which Oracle uses. I used one more hint, which we could not turn on or off directly earlier: range optimization. One more “intuitively” documented feature is the ability to turn on or off a particular optimization. This works only for BKA, BNL, ICP and MRR: you can specify NO_BKA(table[[, table]…]), NO_BNL(table[[, table]…]), NO_ICP(table indexes[[, table indexes]…]) and NO_MRR(table indexes[[, table indexes]…]) to avoid using these algorithms for particular table or index in the JOIN. So we can specify custom QB_NAME for any subquery and specify optimizer hint only for this context. The post Optimizer hints in MySQL 5.7.7 – The missed manual appeared first on MySQL Performance Blog. in our table we may want to filter or group by year(FlightDate), month(FlightDate) or even dayofweek(FlightDate). The “brute-force” approach: use the above Date and Time MySQL functions in the query; however it will prevent MySQL from using an index (see below). Generated columns will allow you to declare a “Virtual”, non-stored column which is computed based on the existing field; you can then add index on that virtual column, so the query will use that index. Now I want to find all flights on Sundays (in 2013) and group by airline. One problem with the trigger is that it is slow. In my simple example it took almost 2x slower to “copy” the table using “insert into ontime_sm_copy select * from ontime_sm” when the trigger was on. Here we add Flight_dayofweek tinyint(4) GENERATED ALWAYS AS (dayofweek(FlightDate)) VIRTUAL column and index it. ERROR 3105 (HY000): 'Virtual generated column combines with other columns to be indexed together' is not supported for generated columns. Now MySQL will use an index and completely avoid the filesort. Now the big disappointment: all operations with generated columns are not online right now. ERROR 1846 (0A000): LOCK=NONE is not supported. Reason: '%s' is not supported for generated columns.. Try LOCK=SHARED. I hope it will be fixed in the future releases. Generated columns feature is very useful. Imagine an ability to add a column + index for any “logical” piece of data without actually duplicating the data. And this can be any function: date/time/calendar, text (extract(), reverse(), metaphone()) or anything else. I hope this feature will be available in MySQL 5.7 GA. Finally, I wish adding a generated column and index can be online (it is not right now). The post Generated (Virtual) Columns in MySQL 5.7 (labs) appeared first on MySQL Performance Blog.